How to easily turn junk food into health food! An ideal healthful, delicious breakfast! 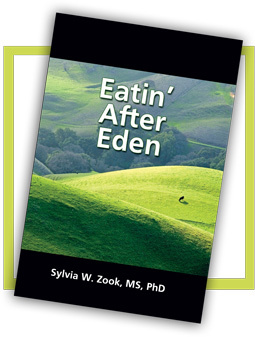 Read all about the necessity of a healthful, high protein breakfast necessity in Eatin' After Eden. This delicious one includes countless nutritious benefits from it's components of quality complete protein, and complex carbohydrates of unique benefits of organic rolled oats. Eggs provide a huge array of nutrients, including best fats. An entire chapter about the important inclusion of quality protein at breakfast is includedd in the book. What is added here is this special complex carbohydrate providing energy, and that lowers blood sugar and cholesterol as needed, as opposed to most carbohydrates consumed by Americans today. We did small clinical trials with this breakfast, replacing the best supermarket "whole wheat" bread with filling servings of the organic rolled oats. Eggs and chicken breakfast sausage were continued as before. After one month HA1c testing was performed, the most accurate indicator of glucose. According to the HA1c, blood glucose normalized from 6.5 average to 5.5 average in just 4 weeks of enjoying this breakfast while continuing the Eatin' After Eden healthful lifestyle as before. No doubt testing after 3 months would have produced even more positive results since the HA1c reveals blood sugar for approximately 3 months previous. Cost of the organic oats compared with the usual one slice of more expensive bread, was almost equal. An unexpected benfit (for most participants in the study) was the loss of an average of three pounds each as appropriate, at a safe rate. Place oats in covered quart size pan with 1 1/2 cups filtered water to soak overnight, or at least two hours. Next morning add 1/4 tsp. sea salt and cook on low heat until done and water is almost used up, stirring occasionally. Then add eggs one at a time and stir gently but well after each, until egg white is lightly done. While oats are cooking, place one heaping tablespoon of ground chicken mix for each serving of the chicken sausage in small frying pan, turning after a minute or so and mashing with the spatula to flatten, until done. Cut into small pieces with spatula and add to oat mixture and stir. Serve separately. 2 Servings. Halve ingredients for one serving or double for 4. LEARN HOW TO PREPARE YOUR FOODS HEALTHFULLY AND SCRIPTURALLY WITH YOUR OWN COPY. 2. Combine coconut oil and water. 3. Whisk water into mixed dry ingredients. Add more water, one tablespoon at a time to make a thinner batter as needed. Batter thickens as it sits and if not all used at once. Add more water as necessary. 4. Heat lightly greased medium size pan over medium heat. 5. Pour 1/4 c. batter into pan, lift and tilt several directions to edges of pan. 6. When pancake stops bubling and is dry on top, flip and cook until bottom is light brown. This crêpe is excellent for any meal. It's use in many dishes is limited only by your imagination and recipes. It is handy to keep in the refrigerator for wraps for lunch, or scrambled eggs or organic beef sausage for breakfast, and crêpe desserts topped with whipped cream for dinner. We welcome your own recipes that include permission to publish here, with credit if you wish. 1. Add all dry ingredients to sifter over medium size bowl and sift. 3. To prepare medium size crêpes to use immediately add 2 tsps. coconut oil to medium size frying pan; heat and tilt pan to coat entire bottom of pan with oil. Return to heat and add 1/4 c. mixture and lift and tilt pan to reach sides. Return to heat, lightly brown and turn crêpe. Lightly brown other side until done. Enjoy! If not using immediately, store in refrigerator in container with lid, preferably with pouring spout. To use, stir, and follow instructions above for cooking. Keeps approximately one week; however, you probably will use this handy, versatile dish before the end of the week! Have you considered enjoying eggnog for breakfast? This is a wonderfully delicious and wholesome one, not the typical sugary one. The world's oldest living human who is 117 years old, credits 2 raw and one cooked egg for the past 90 years for her longevity. This recipe may be doubled or tripled; it is a very effective and economical way to build the immune system quickly! As to the fat in eggs raising cholesterol, a colleague consumed 9 eggs/day for a lengthy time with no increase in cholesterol. "How is that possible?" you ask, having been taught consuming eggs could lead to CVD. The fact is, there is also lecithin in eggs that prevents this, and is itself very healthy. Whisk eggs well. Add cream and mix well. Add other ingredients; whisk well and enjoy! Or refrigerate. Prepare as above. Enjoy immediately or refrigerate. The following account of Paul Stitt in the above mentioned, clearly depicts the reason for America’s problem with fractionated, denatured foods. Stitt tells of four sets of rats given four different diets in a study by cold cereal producers. "The first [set] received plain whole wheat, water, vitamins and minerals. Another group received Puffed Wheat, water and the same nutrient solution. A third set was given water and white sugar, and a fourth given nothing but water and the chemical nutrients (isolates). The rats which received the whole wheat lived over a year on the diet." Those given only water and synthetic vitamins lived about eight weeks. [One hundred percent whole-food supplements would have sustained their lives indefinitely, the same as whole foods.] The animals fed refined sugar and water died after a month. "But [the company’s] own laboratory study showed that rats given vitamins, water and all the Puffed Wheat they wanted died in [just] two weeks." Try other whole grains soaked 24 hours (plan ahead), including ancient grains, then simmered at very low temperatures, served with real butter (raw if possible), and Celtic sea salt. Grinding your own fresh whole-grain flours is easy and quick (NFS whole grain flour becomes rancid soon after grinding unless refrigerated), makes delicious, nutrient-rich blintzes and pancakes that "stick to your ribs" when accompanied by such quality protein as organic beef or turkey sausage. Combine dry ingredients in large bowl, beginning with oats. In smaller bowl whisk eggs, add milk, then melted butter or coconut oil. Add to dry ingredients and mix with large spoon. Grease 7x10 or 9x9 baking pan. Add mixture and bake for 35-40 minutes until set. Serve immediately with 1/2 – 1 cup milk poured over the top, or cool and place in refrigerator with lid on. This dish is delish warm or cooled. In the early fall we daily harvest from our small garden various fruits and vegetables that are not ripe until then. We enjoy whole meals with these, with the addition of high quality protein and raw homemade goat yogurt or milk, with very nutritious figs and grapes for snacks full of antioxidants and other phytonutrients. The meal plan here contains the highest quality macronutrients of protein, fats/oils, and carbohydrates. The timing for all this ripening is not happenstance, but the loving Creator's intention to increase detoxification, intense nutrition, and antioxidants in time for the extra thrust our bodies require for building of increased strength and immunity for the coming days of exposure to others' colds and flu. An important part of this magnificent repast is raw red beets! Hungarian Dr. Firenzi reportedly uses controlled amounts of raw beets for its tumor-inhibiting flavonoid called betazyane, and its capability of significantly increasing cellular oxygen intake. Its folate prevents birth defects when consumed by women of child-bearing age. Folate reduces levels of homocysteine, a molecule that is a risk factor for cardiovascular disease and stroke, and is important especially for geriatrics. A study reported in The Lancet found that folate significantly improved cognitive ability in the elderly. Only one-half cup of the steamed beet tops contains approximately 3,670 IU of the vitamin A precursor beta carotene. One cup of the zucchini supplies 280 mg. of potassium, and is also high in beta carotene. Note: Most non-organic beets are now GMO, used to make refined sugar. Raw red beets, shredded, with equal parts of organic extra virgin olive oil and raw apple cider vinegar from the natural foods store. So grateful for the Creator's bounty were we that we stopped mid meal to thank Him again while enjoying this magnificent repast! Having the main meal at lunch time is healthier. However, this four ingredient recipe lends itself to breakfast, lunch or dinner, from babies to the older generation. It is a complete gourmet delight including quality protein, healthy carbs and best fats as well as vital vitamins, minerals and trace minerals. 1. Slice avocade open lengthwise. Remove meat with a tablespoon into a medium size bowl. 2. Peel and split banana lengthwise, holding together; then slice horizontally into bowl with avocado. 3. Cut apple in half and remove core. Then grate. 4. Using potato smasher, mash all ingredients to mix well. 5. Stir in protein powder. Miss egg salad because you don’t want to use the mayonaise on the market? Here is an excellent alternative! 1. Cook eggs on low simmer for 15 minutes and cool in cold water for 15 minutes. 2. Peel and chop boiled eggs, and set aside. 3. In med sized bowl combine avocado, vinegar, mustard, and salt. Mash with a potato masher until smooth. 4. Add chopped boiled eggs and mix gently. 2. Mix dry ingredients in small mixing bowl. 3. Add egg and coconut oil and mix well. 4. Let mixture sit for a few minutes while flour absorbs liquid. 5. Pour half the batter on to baking sheet, forming a circle, then form a second circle. 6. Bake for 10-12 minutes until light brown. online; or 1 1/2 c. spelt flour plus 1/2 c.
Do you find yourself avoiding the bathroom scale since the holidays? To look at cauliflower you might think it high in carbohydrates that quickly pack pounds. Actually this wonderful member of the cruciferous family (kale, collars, Brussels sprouts, cabbage, and broccoli) is very low in carbs. It provides an excellent substitute for fattening, blood-sugar-spiking starchy foods. Besides its many B vitamins, vitamin C (raw), and minerals, there are many studies linking cauliflower and its phytonutrients to cancer prevention. Without the more-than-mild flavor of some members of its very healthful family, the more neutral cauliflower lends itself to many culinary enhancements. Here we have taken the very simple approach, using only three other ingredients for a quick but very nourishing dish. However, since it is such a low carb vegetable (only about 3 net grams of carbs per cup**), this dish may be prepared topped with a tasty and healthy white sauce as well for less than 10 total grams of carbs for such a delicious dish! By the way, if your family is negative toward steamed asparagus, serve it with this cheesy white sauce---you and they will be surprised by their pleasantly positive response! 1 small or 1/2 large cauliflower. **One cup raw flowerets has a total of approx. only 4 grams of carbohydrates; however, 2 grams are from fiber which provides no calories and does not raise blood glucose. Thus there are 2 grams net or effective carb count (ECC) in cauliflower, an extremely low amount that does not create a blood sugar (glucose) spike. Whoever heard of healthful white sauce? Prepare this nutritious topper with organic whole foods and you’ve got a real winner! Its butter is absolutely loaded with good things. Melt butter in heavy saucepan over medium heat; add flour and salt, and stir until smooth. Gradually add milk and stir until sauce slowly boils, and becomes thick and smooth. Use immediately, or cover and place over simmering water, stirring occasionally. “Knowledge is knowing a tomato is a fruit; wisdom is not putting it in a fruit salad.” In other words, wisdom is knowing how to apply knowledge. Besides lunch and dinner, these sugar-free, melt-in-your mouth muffins with their healthy oil, many minerals, and complex carbohydrates, are also a good choice for a hearty breakfast. Try them buttered with over-easy eggs and organic turkey sausage. They are a good choice for Candida albicans patients' diets as well. 1. Heat oven to 400o. Grease 12 cup muffin pan or place muffin paper cups in pan. 2. Measure dry ingredients into sifter sitting in medium size bowl and sift. 3. In small bowl whisk eggs slightly and add milk, stevia, and melted butter or coconut oil, and stir. 4. Pour into dry ingredients and mix. 5. Fill muffin cups 2/3 full. 6. Bake 25 minutes or until toothpick comes out clean, and remove from pan onto rack to cool. Makes one dozen. This recipe may be doubled in order to freeze some muffins for other meals later. This recipe makes a delicious, high nutrient nut bread, great for enjoying now, plus freezing loaves for those cold winter days when zucchini is unavailable. For you who have more than you can use or share, zucchini can be shredded and frozen for use in this recipe later, as can tomatoes for winter soups, both without blanching. Just thaw the zucchini package in cool water an hour or so before preparing this recipe, squeezing some of the water out before use. Mix all dry ingredients together in a large bowl and set aside. In a medium size bowl beat the egg, add the melted coconut oil, zucchini, carrots, and nuts, and mix well. Add the wet ingredients to the dry mixture, and stir only enough to incorporate the dry ingredients. Mixing too long causes dry bread. Pour the batter into the greased bread pan, and sprinkle the top with the currants. Place in oven, and bake for approximately 45-50 minutes until a knife or toothpick stuck in the center of the bread comes out clean. Remove from the oven when done, let cool in the pan five minutes, then carefully turn out onto a cooling rack or plate. Enjoy warm with yellow butter slathered on slices, or cooled. A real meal, this deceptively simple dish includes quality protein, complex carbs, healthy fats/oils, and tomato's lykopene. The recipe is an example of a quick and easy healthy conversion of a far less nutritional one. Place olive oil in 2 qt. sauce pan with lid. Add chicken, cover, and cook on low about 20 min. or almost done. Add broth, tomatoes, and lentils around chicken, leaving chicken on bottom and being sure lentils are in liquid, not on top of chicken. Cover and simmer about 15 minutes (tilt lid if necessary to prevent boiling) turning chicken once. Do not overcook lentils. Remove chicken from pan, cool a minute, then remove meat from bone with paring knife, cut into bite-size pieces. Stir to combine ingredients. Depending upon how much liquid you use, this may be enjoyed on the plate or in soup bowls. Serve with a green salad. Serves 3 or 4. One thigh = 25 g. protein. The very nutritious lentils provide additional protein, plus complex carbs. *Chicken breast may be used, however, the juice of thighs adds to flavor of this dish. If breast is used, add more broth. 1. Peel and cut broccoli into bite size pieces. 2. Place in steamer, and sprinkle with salt and garlic powder. 3. Cook 4-5 minutes after water begins to boil in steamer. 4. Place butter and liquid amino acids in bottom of bowl of sufficient size to hold steamed broccoli. 5. Add broccoli when just done and stir until all is coated. Serve immediately. Incredibly nutritious, this beautiful vegetable is an excellent source of vitamin A (precursor) and vitamin K, both important for vitamin D utilization. Also for vitamin C (if not overly cooked), chromium and folate. It is a very good source of dietary fiber, pantothenic acid, vitamin B6, vitamin E, manganese, phosphorus, choline, an excellent form of vitamin B1 (provided conventionally as unhealthy mononitrate), potassium, and copper to help balance its zinc). Broccoli is also a good source of magnesium, omega-3 fatty acids, calcium, iron, niacin and selenium. SO SO GOOD AND SO SO GOOD FOR YOU! Quick and easy, delicious and nutritious, is this low carb dish. Enjoy it often for lunch or dinner, as a wonderful vegetable dish, or entree' with meat. See also recipe for beef broth below. 1/2 c. chopped red bell pepper. 1. Twist or slice green leaves off top off pineapple. Then slice approximately 3/4" of top of pineapple and discard. Remove a thin slice with large knife. Then using paring knife, hold knife upright inside shell, and separate flesh inside pineapple from outer shell. Remove shell, leaving pineapple slice. Cutting from core (if edible slice it with the pineapple meat) outward, making thin triangles). Set aside. 2. Place broth in pan, and add vegetables. Cover and cook over medium heat; stirring every 6 minutes or so. Don't over cook. 3. When done, grate fresh ginger across top of vegetables, add meat if desired, and stir. Distribute thin pineapple wedges over top of cooked vegetables (and meat if using) and serve. **To make broth, simmer bag of fresh beef bones in 2-3 qts. water for 6-24 hrs. Remove bones and place broth in 2-3 cup freezer containers and freeze. Keep one container in refrigerator to cook with instead of water (e.g., green beans, quinoa, and other foods that require simmering in liquids). Let the family join in preparing this simple and quick dish! 2. Add beef broth and stir. 3. Add chopped and sliced vegetables. 4.Stir 3 or 4 times until just done, not well done. 5. Sprinkle pineapple over the top and serve. Eggnog - Rich, Quick & Low Carb! This is a wonderfully delicious and wholesome eggnog, not the typical sugary one. The world's oldest living human who is 117 years old, credits 2 raw and one cooked egg for the past 90 years for her longevity. This recipe may be doubled or tripled; it is a very effective and economical way to build the immune system quickly! Whisk eggs well. Add cream and mix well. Add other ingredients and whisk well again. Add ice cubes as preferred. Critical Vitamin D: Last minute reminder! A deficiency of this vitamin/hormone can be involved with such conditions as colon cancer, important calcium filtering by kidneys, bone loss, and countless other issues. Vitamin D also helps prevent cancer, rickets, and bone loss; it enhances innate immunity, even against TB now again a concern in the US. The same mechanism is important for infectious agents as influenza. It has been shown to be important for both Type I and type II diabetes, as well as for playing a role in control of hypertension. This is a good recipe for participation of older children and hubby, providing quality protein and many other nutrients in the sprouted bread, vegetables, sea salt and garlic. The vegetables and bread may be prepared the day before. 2. Using coconut oil or butter, grease 9"x13" pan. 3. Place bread cubes in medium size bowl and pour melted butter over the bread and toss. 4. Beat eggs and mix in milk, garlic powder and salt. Add to bread cubes and mix. 5. Add sliced zucchini, chopped bell pepper, cauliflower and onion. Mix well. 6. Transfer mixture to baking dish and sprinkle the grated cheese over the top. 7. Add aluminum foil canopy, being careful not to touch the contents with the foil. Bake for 35 minutes or until vegetables are done. 8. Remove from oven and cut into 6 servings with large, straight edge spatula. Scoop out servings with the spatula, scraping the bottom while doing so.for a relatively clean baking dish. 1. Pour broth into soup pot, add vegetables except okra, peas, tomatoes, and meat (if used), and simmer (do not boil) until almost done. 2, Add lentils, okra, and peas, and continue simmering until done, adding meat just long enough to warm before serving. You may omit meat or lentils, or include both, as preferred. *Freeze fresh basil as available; later while still frozen crush before tossing into soup, etc..
*Freshly harvested, ripe tomatoes may quickly and easily be frozen for later use. Cut into quarters, place on a cookie sheet, cover with a paper towel, and freeze 2 hours. Remove paper towel, and slide off cookie sheet into plastic freezer bag. Use as needed in recipes calling for cooked tomatoes. Rated #1 with more than 500 responding readers! This is a satisfying soup that is done in an hour with a little planning ahead. * The many who have partaken of this culinary prize say it is well worth the planning (soaking the beans overnight). Other vegetables and herbs in the pot plus Italian-style turkey sausage make it a "souper" nutritious treat! NOTE: Just because this meal tastes incredibly good doesn't mean it's terribly bad. Au contraire. Besides their nutrients and fiber, beans are a low glycemic food. With their lower rise in blood sugar, in moderate amounts such foods are particularly beneficial to those with sugar dysregulation issues including diabetics, hypoglycemics, dieters, and those with insulin resistance (Syndrome X). 1 lb. navy beans or white beans of your choice. 1 lb. Italian-style turkey sausage sliced crosswise 1/2"
*A day before you wish to serve the soup, place beans in a large bowl and add enough water to stand about 2" above beans; cover, and allow to soak at least overnight to improve digestibility, to save an hour's cooking time, and to neutralize [deactivate] phytates in beans, that prevent mineral absorption. If broth is frozen, place in refrigerator to thaw overnight while beans soak. Pour oil in large soup pot, add onion and garlic cloves and sauté on low heat for 4-5 minutes, stirring a couple of times. (If using garlic powder, add when onions have finished cooking and stir.) Add broth, drained beans, and bay leaves. Simmer with lid off so that soup never boils and nutrients are saved. (Boiled beans have chiefly carbohydrates and little if any protein.) Cook until beans are almost done, approx. 45 minutes. Cook sausage while beans simmer; slice, and add to soup pot together with vegetables and liquid amino acids (natural foods store). Continue simmering, stirring occasionally, until carrots are al dente and kale is tender. There you have it, a delectable meal fit for a king, with all macronutrients (quality protein, complex carbohydrates, healthy oil/fat), vitamins, minerals, and phytonutrients. Worth its weight in gold, this marvelous marinade is just the thing for these days of thrift. It allows you to enjoy some of the more economical cuts of meat, e.g., flank or round steak, certain roasts, and notoriously tough, grass-fed beef. Chicken and lamb shanks are also scrumptuous with this treatment. Mix the above ingredients in a 6"x1''x2" pan or whichever size fits your cut of meat. Place it in the pan and prick meat with fork. Turn it a couple of times. Cover pan with plastic wrap or lid, and refrigerate. Turn meat every 4-5 hrs. during daylight hours if possible, for couple days; remove meat from marinade. To cook, place about 5" below 350°-375° broiler, about 5 min./side, or a covered roaster, depending on cut and type of meat. For beef, cut a thin slice off one end cross-grain to check for doneness (rare or med. rare is best). DO NOT OVERCOOK BEEF. This fast and easy treat lends itself to enhance any chosen dish for breakfast, lunch, or dinner. Low carbohydrates, it is ready to dress up the plainest spice cake or pancake so that it quickly becomes a gourmet dish! 1. In a small pan cook berries for about 8 minutes in the pure water on medium heat, smashing some berries with a slotted spoon. Remove from heat. 2. In a small bowl stir arrowroot, stevia, and the tablespoon of water. 3. Sitr into berries and return to heat for a few minutes, continuing to stir until the sauce is somewhat thickened. 4. Serve immediately or chill. It will thicken further if chilled. Keeps a couple of weeks in refrigerator. Delicious atop the Quick and Easy Low Carb Cheesecake (see recipe in desserts). You won't need an ice cream freezer for this fabulously easy treat of high nutrition. And besides being so delicious, it is ready in minutes! What more could you ask for a summer dessert? 1. Take berries out of the freezer. 2. Place cream, eggs, and stevia in blender. Whirl few seconds. 3. Turn blender to high and add strawberries one at a time until mixture is the consistency you wish. 4. With tablespoon, turn into dishes of choice and serve immediately. Or store in freezer, removing 15-20 minutes before serving. Here we have a cacao (raw) verses chocolate (processed) delicious, healthful pudding. Carob can also be used in part or for the cacao. Quick and easy, this dish requires but a few minutes. 1. Slice avocado around the middle of the seed. Part halves. Remove seed. Scoop out meat and place into a blender. 2. Peel banana; slice into 1/2" horizontal pieces and add to blender. 3. Add remaining ingredients and blend until smooth, using a spatula to add bits on the sides of the blender. 4. Remove pudding to a covered dish and chill for few hours or overnight. Creme Brulee - Healthy & Delicious! Not just for dessert, but when served with entertaining your guests will be blown away that anything so rich and luscious could be so good for you! 2. Place 5 ungreased custard cups in 8" square pan and add warm water about half way up the sides. 2. Heat cream over medium heat to just before bubbling begins, and remove from burner, taking care not to overheat so that yolks do not cook while mixing. 3. Separate egg yolks from whites. 4. In medium size bowl whisk together yolks, vanilla, salt, and stevia. Continue whisking while slowly adding heated cream. 5. Pour into custard cups. 6. Bake in the warm water bath for 25-30 minutes or until set. When done it should jiggle a little in the center. Remove from the oven and set on top of stove, allowing the custard to cool while still in the pan of hot water. The custard will continue to cook, and will no longer jiggle in the center. 7. Enjoy warm or chill in the refrigerator. This nutritious, raw food requires minimum time. Be sure to check out the NutriNote below. 1. Whip coconut oil in medium size bowl; warm first if necessary for a somewhat fluffy consistency. If the oil is liquid, skip this step. 2. Add other ingredients, with stevia to taste, and mix. 3. Pour into bread pan or 5x9 pan, and spread evenly. Cover. 4. Refrigerate until hard, approximately three or more hours. 5. Cut into 16 squares. Carbohydrates per serving: 1 gram. There are 16 grams of carbohydrates in this entire recipe. If you choose to double the size of the squares, there are still only 2 grams carbohydrates per serving, a negligible amount to satisfy your chocolate desire! NutriNote: Virgin coconut oil is highly nutritious and provides countless health benefits according to Dr. Bruce Fife, Director of the Coconut Oil Research Center who has written extensively regarding this food. Consume moderate amounts of this "sweet treat" with carob since it contains a high amount of omega 6 that should be balanced with omega 3 perhaps 2:1. This nourishing, crustless cheesecake is sugar free, and egg free for those allergic to eggs. 1. Sprinkle gelatin over cup of pure water in a small saucepan; let stand 1 minute. 2. Stir over low heat until gelatin is dissolved. 3. Blend cream cheese, yogurt, stevia, and vanilla until smooth. 4. Slowly add gelatin mixture and and beat until smooth. 5. Pour into flat bottom 8x11 glass dish for chilling. 6. Sprinkle nuts over the top before chilling, or spread mashed berries over top after chilling and cheecake is firm, as preferred. 7. Cover with clear, plastic wrap and chill approx. 45 minutes or more. An oh-so-good, home-made, bowl of this healthful treat will literally melt in your mouth unlike the commercial ice cream "chemical concoctions" with their not so healthy added ingredi-ents.This treat won't cause the headaches some suffer from extremely cold foods, and is sooo delicious! Stevia sweetened carob chips (opt.) available on Amazon.com if not locally. 1. Place all ingredients in ice cream freezer (an inexpensive one from a "big box" store works well). 2. If you have the old fashioned type of ice cream freezer, place 2" of ice around the canister and sprinkle one-fourth cup of rock salt (from super-market) over ice. Layer ice and rock salt until it reaches near the top of the canister. Churn for 20-30 minutes or until the ice cream is the firmness you enjoy. Or follow the instructions that came with your ice cream freezer. Optional: After the mixture has frozen, mash blueberries, strawberries, or use semi-sweetened carob chips, and gently spread atop ice cream in bowls. Tip: Double the recipe and put some in the freezer for later! 1. Add sliced prunes or raisins to water in measuring cup and let soak couple hours or more. 2. Slice Romaine lettuce leaves horizontally and vertically for salad. 4. Mix all ingredients except cream and walnuts. 5. Add 1/2 cup whipped cream or sufficient amount for good consistency, saving some for topping. 6. Mix in 2 scoops of whey powder if desired. 7. Serve on beds of more lettuce removed from stems or in salad bowls without lettuce bed, topping with remaining whipped cream and chopped walnuts. How 'bout a fast and tasty nutrient-dense snack or salad? Everyone should include avocado in the diet often. Eaten as snack or salad, this outstanding fruit is for one and all—from toddlers to the very elderly with chewing ability or not. Consumed raw as it is, nutrients are not lost during preparation.The fats in this fruit are some of the best, including the monounsaturated fat as found in extra virgin olive oil. This is a great weight loss recipe with its low carbs, healthy fats, and high quality protein, with none of the refined sugar or white flour, etc., of many snacks. Eaten in the afternoon,even this small amount of wholesome food "sticks to the ribs" well into dinner time. Cut avocado in half, carefully twist to remove one-half from seed. Insert pointed knife into seed and pry it out. Fill holes where seed was with ricotta cheese. Sprinkle with Parmesan cheese. Place olive halves and tomatoes on top. Add Pico de Gallo salsa if using. Enjoy! Avocados & Eye Health: This fruit contains lutein, a carotenoid, and an important antioxidant that is associated with lower risk for eye diseases by reducing the risk of macular degeneration, the leading cause of blindness in adults 65 years of age and older. At the same time it helps maintain vibrant skin. Layer the first five ingredients, then sprinkle with pumpkin seeds and cheese. Add the sour cream, and top with salsa. Ingredients are best purchased from NFS or organic foods section of supermarket. Even pots or flower beds accommodate the growing of at least the first three ingredients! Don’t be put off by the simple title of this recipe. Neither that it is delicious, fast, and easy. As noted below this recipe, this simple salad is a treasure trove replete with countless nutrients and health benefits of many powerful kinds, all in meaningful amounts, and high fiber of both types as well. 1. Fill one cup half full of raisins. Fill the rest of the cup with pure water, and set cup aside for raisins to soak while preparing the salad. If not serving immediately, omit this step as raisins will absorb liquids of salad while stored in the refrigerator. 2. Place carrots in medium size bowl. 3. Cut slices of fresh pineapple with large serrated edge knife. Then lay slices flat, turn smaller knife on end and remove peel. Slice tidbits approximately 1/2” wide on far end, then use upright knife to cut away from core, though core may also be used if not hard and is chewable. Add tidbits to carrots. 4. Drain raisins and add to carrots and pineapple. 5. Add yogurt to other ingredients and mix. Note: While this salad is abundantly rich in nutrients, it is high in carbohydrates as well. However, a brisk walk after enjoying it can help with the blood glucose level since exercise enables the uptake of this without high insulin. Health benefits and Power House of Nutrients available in this extra nourishing salad. Raisins are perhaps best known for their iron. Like grapes, they contain the phytochemical compound resveratrol. This polyphenol antioxidant is anti-inflammatory, anti-cancer, and has blood cholesterol lowering activities. Raisins are high in fiber. It requires an entire page to list all the nutrients, phytonutrients, and significant health benefits of this dried fruit that are far too many to include here. Please see http://www.nutrition-and-you.com/raisins.html for an excellent and comprehensive description. Carrots contain a high amount of the vitamin A precursor, vitamin B complex, vitamin C complex (not just ascorbic acid, the “outer shell),” and vitamin K required for calcium absorption. 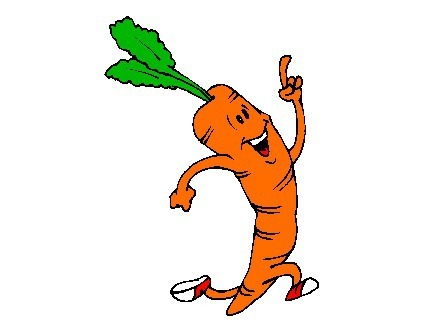 A cup full of raw carrot slices contains 14% of the DV for fiber. Fiber bulks up stools whether diarrhea or constipation, a healthy benefit with IBS, so that food moves through the digestive tract at a normal speed. The health benefits of pineapple are nearly countless. It also contains bromelain, and enzyme that not only breaks down protein, but also is a powerful anti-inflammatory found to reduce arthritic symptoms in muscles and joints. This fruit is one of the richest resources for vitamin C complex (not just ascorbic acid, the “outer shell") that stimulates white blood cell activity of the immune system. It also contains a meaningful amount of foliate as a balance with vitamin B12. It's antioxidant properties fight free radicals, cellular by-products that damage and disrupt organ systems. They may even cause cell mutation to cancerous ones. This delightful, fresh, whole food also contains fiber, both soluble and insoluble, with the former feeding probiotics, the good bacteria in the intestine. The highest mineral level of pineapple is its manganese, important for bone growth, its strengthening, and repair. Pineapple is high in potassium, calcium, and magnesium, all more than important for maintaining optimum health. Fresh coconut is a treasure trove of minerals and trace minerals. It too is rich in manganese (a whopping 60% of the DR) with its important health benefits as shown above for pineapple. The selenium provided by this ingredient is important for production of the thyroid hormone tetraiodothyronine (T4) and its conversion to the active form, T3 (triiodothyronine. Thyroid issues are very common today, and this trace mineral is a vital benefit. The immune system's T cells which destroy harmful bacteria, also require selenium. Selenium is also important for the development of brain cells. Coconut, which has been enjoyed by the people of the South Sea Islands for eons as a major food staple, contains the good form of saturated fat that these people have proven is not associated with heart disease. Dr. Bruce Fife of the Coconut Research Center, has well proven the health benefits of this highly beneficial fresh, whole food - and oil! Studies conducted at the University of Scranton, PA, found cranberries to contain the highest level of phenol antioxidants when compared to 19 other common fruits! (Some of the other fruits found to be rich in phenols, in descending order after cranberries, were apples (think heart health), red grapes, strawberries, pineapples, bananas, peaches, lemons, oranges, pears and grapefruit). 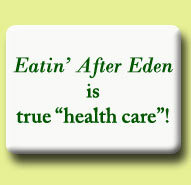 It takes living foods to sustain abundant life, healing, and restoration. This juice is an outrageously nutritious, and refreshing example. Chock full of vitamins, minerals, and phytochemicals that help prevent cancer, it is also useful for detoxifying and liver health. Its antioxidants work for your heart health. We should also mention it's really quite delicious! Isn't it just like our Creator to package His good things this way? Drink immediately, before, with, after, or between meals. Do not store juice, it loses nutrients quickly and oxidizes. An 8 ounce glass counts as 2 servings of vegetables. Cancer patients and those with frail constitutions should begin with 2-4 oz. and increase daily to tolerance. Makes 16 ounces of juice. In medium size bowl mix all ingredients together except walnuts. Pour out chopped walnuts on plate covered with waxed paper. Roll heaping teaspoons of mixture in chopped nuts to form balls covered with nuts. Refrigerate for few hours before eating, or place in freezer in tightly covered rectangular container with bottom covered with waxed paper as preferred. The balls do not become hard in the freezer indefinitely. 2. Line baking sheet with parchment papr. 3. Mix ingredients in food processor or pastry blender. Dough will become soft and sticky. 4. With flatware teaspoon, divide into 16 small balls, and flatten lightly. 5. Bake until edges are golden brown, aproximately 10-11 minutes. Don't over-bake. 6. To prevent crumbling, allow the cookies to cool completely before removing from baking sheet. This frozen treat pairs highly nutritious and creamy avocado with carob chips, using stevia as sweetener. 1. Heat and mix cream and milk, carob chips, cinnamon and stevia in small pan over low heat; stirring until smooth. Cool for 5 minutes. 2. Place avocado and mixture in blender. Blend on high until smooth. 3. Remove blender pitcher from base; add carob chips and stir. 4. Divide into popsickle holders and paper cups. Freeze for 4 hours or until hard. Keep cups and popsickles in freezer. This is a fast and easy very nutritious snack children especially enjoy because of the title. They also enjoy placing the "ants" (raisins). However, adults enjoy it just as much. Good for brown bagging too! Slice celery stalks into 4" long pieces. Stuff the sticks with first, wide, butter knife. Place raisins on the "log" and gently push them into the peanut butter. Enjoy! Raisins are rich in iron, calcium, magnesium, and boron (autistic and SDA children especially require this). Celery is rich in all the major minerals, with small amounts of all the B vitamins. Peanut Butter: A serving of peanut butter has 3 mg of vitamin E antioxidant, 50 mg of magnesium for bone and heart, and 200 mg. of potassium for muscles. Studies have shown that eating peanuts can decrease risk of heart disease, diabetes, and other chronic degenerative conditions. A Journal of the American Medical Association (JAMA) study reported that consuming one ounce of nuts or peanut butter (about 2 tablespoons) at least 5 days a week can lower the risk of developing diabetes by a whopping near 30%. The fat in peanut butter is heart-healthy monounsaturated fat. Another recent study reported that insulin-resistant adults who ate a diet high in this fat had less belly fat than people who consume more carbohydrates or saturated fat. Don't buy reduced-fat peanut butter thinking it will shrink your waistline. The amount of calories are the same or more due to the extra ingredients that are added to compensate for the missing fat, even including sugar! Please know that those with hypothyroidism should avoid peanuts. Mix and refrigerate at least 2 hours or more; ideally overnight. Mix again before eating. Enjoy! This recipe was originally for my Candida Conquerors' Confab, however, we all may enjoy it as it is low carb and sugar free. 1. Preheat oven to 3250 and grease 9" square pan. 2. In med. bowl, beat eggs; then add stevia, and butter. 3. Sift together dry ingredients and stir into egg mixture. 4. Add nuts if being used. 5. Pour into pan and bake for 15-20 min. until tooth pick comes out clean. Don't overbake. 6. Let cool and cut into 16 glistening, rich squares. 1One 1 1/2” square contains approx. 10 grams of carbohydrates.